The following are links to all the pieces I wrote for Awoko newspaper (though one or two of them never ended up online). In the first section are the daily columns I wrote, and in the second section the news and feature stories. Pieces in bold are ones I’m especially happy with. I’ve also put notes under some of them to explain or expand on things, partly for those curious and partly so I don’t forget. Part one of my account of a reporting trip to Lunsar, north of Freetown. I went on this trip with two of my colleagues just a few days after I arrived. After I wrote this, my colleagues — partly joking but also serious — called me out for heavily quoting and paraphrasing them in the column, and basically broadcasting to the world everything they’d said. Worryingly, in the next few days other colleagues at Awoko, some I was just meeting for the first time, told me they were hesitant to answer my questions about things in Sierra Leone because they didn’t want to end up in a column. Luckily, everyone’s caution disappeared before too long. Using conversations as fodder for writing might kind of a creepy thing to do…but it’s definitely a journalistic thing to do, too! I wrote a blog post explaining more about how this column came about. For a few days after I sat in on a trial for a case of ritual murder for black magic, I couldn’t stop thinking about it. I was most disturbed by the fact that such a tragedy wouldn’t have happened without the strong belief in black magic common in Sierra Leone. This month, two suspects in the case were sentenced to death by hanging. According to Amnesty International, Sierra Leone hasn’t executed anyone before this for ten years. An ominous quote from this article: “I have called on the Director of Prisons to clean the gallows so that we will not be found wanting when the situation arises.” You can read some interesting local reactions to the verdict here. I think the way the media covered this case says a lot about how entrenched belief in black magic is here. News articles would mention that it was a ritual murder, but not make a big deal about it, almost as if it was a normal cause of murder like robbery or jealousy. Of course, people believe all kinds of things around the world, many of them more outlandish than black magic (see: Scientology). But I’m still fascinated and disturbed by how apparently widespread these beliefs are in Sierra Leone. Does Sierra Leone really need oil? A column I wrote after reporting on a young girl who needed treatment abroad for a back injury. I wrote more about this and other stories I wrote about healthcare in Sierra Leone in this blog post. Salone government just received millions. Why not invest in Tacugama Sanctuary? More about my visit to one of Freetown’s roughly 60 slums in this blog post. You can also watch a video I shot while walking out of the slum. Do we need to settle for incremental change? Happy 18th birthday, Awoko Newspaper! As a young person, I am sickened and appalled at the death of innocent civilians, especially at the hands of officers whose duty is to serve and protect the citizens. There is no justification for using firearms in a post-war nation that is still trying to surpass those dark days of the civil war. Here in Canada, I can’t remember the police ever using more than pepper spray on any demonstration in the past 15 years. I hope there will be an unbiased investigation into these shootings and hope such incidents are not repeated in the future. I wish the police were better trained and better educated. Before I came to Sierra Leone, I vaguely remembered reading something about how camera equipment is biased against dark skin, but taking lots of pictures of people that never seemed to turn out right made me realize just how true it is. What will it take to end FGM in Sierra Leone? One of the things that I am proud of my country is the religious tolerance, something that is absent in many parts of the world including the Middle East as you mentioned in your recent blog. There are some parts in the U.S as well where religious intolerance is very high especially at this time of elections, making it difficult for some of our fellow Americans to practice their religion. When I arrive in the U.S, I was shocked to see on the news people being killed for having a different faith and it was difficult to discuss this experience with other people. Well, you can now understand why many of us from Sierra Leone find it difficult to understand any senseless sectarian war whether it is in Nigeria, the Middle East, or some part of the world. As you know in the U.S, many Americans perceive Africa to be a huge country (Sarah Palin is good example of such shameful ignorance) and the portrayal of the continent is mostly based on negative stereotype. So when I told some of my college mates that our religious tolerance in Sierra Leone is far better than the U.S, you can conclude about their reactions, and they quickly points to Nigeria or C.A.R, which are two countries out of fifty-four or so and their conflicts are far more complicated than religious base. I have just started my master’s degree in Public Health and from your stay in the country and visit to Connaught Hospital or recent visit to Bo hospital, you can see that accessing quality healthcare is a monumental challenge. An odd and troubling situation which made me think about how much is really going on under the surface in Sierra Leone. A colleague of mine said it would certainly be plausible for Parliament to embezzle funds…but in this particular case the accuser didn’t give enough evidence. Two weeks ago I wrote a post here explaining my earlier column in Awoko that expressed skepticism about China and Sierra Leone’s relationship — mainly the idea that it should be thought of as a “friendship.” I’m sure there’s a lot going on with the business relationship between the two countries that would require many in-depth investigations to tease out. My column didn’t speculate on that, and mostly focused on reasons why China and Sierra Leone’s relationship has some problems (which I backed up with some limited research I found online). I also criticized the rhetoric of “friendship,” saying the relationship is more business than the enduring brotherhood the Freetown papers wax poetic about constantly. I don’t think it’s too narcissistic to think this was a response to my column in some way, especially since as far as I can tell my column was the only “report” arguing that the relationship between the two countries is more business than friendship. In fact I haven’t seen anything remotely critical of China’s intentions in Sierra Leone in any of the Freetown papers. What indeed is China gaining from Sierra Leone from the millions it’s spent? I guess there’s no possibility it could be access to Sierra Leone’s vast mineral wealth. I’ll link again to this briefing from the South African Institute of International Affairs, which gives a good overview of the relationship between the two countries and areas of concern. Sure, I can’t deny that I’m “ignorant and short-sighted,” when it comes to most things, but the amount of spin in this response piece (if it is a response) is amazing. I wrote a column in Awoko about China’s influence Sierra Leone, and why I think it should be viewed with at least a somewhat critical eye. There are always copies of Freetown’s other newspapers in the Awoko office, and this column was a response to what I read in them: seemingly nonstop fawning about the “friendship” between the two countries. I was hesitant to write the column at first because I thought I was a bit out of my depth, and this isn’t a good place to be in when arguing against the grain. But in the end, it was a combination my colleague urging me to write it (for reasons I’ll explain), and the 45th anniversary of China-Sierra Leone relations coming up, which made it kind of a now-or-never thing. It’s not my favorite column I’ve ever written, but I’m glad I wrote it. It sometimes seems like every third article in Freetown newspapers is about how much good China is selflessly doing for Sierra Leone. From the captions to the headlines and the long blocks of text in between, the framing is anything but objective or even-handed. As much as I like Awoko newspaper, I’d be lying if I said it doesn’t carry its fair share of these types of articles too. In fact, all the pictures above are from different issues of Awoko. I could make a whole other gallery with pictures from the other newspapers if I was really dedicated, but it would be boring, and also would never end. I don’t have a grudge against China, and I don’t think there’s some vast conspiracy here. In fact it’s obvious China has done a lot of good for Sierra Leone. But one reason the headlines and articles declaring the wisdom of Mao Zedong and Siaka Stevens for forging the diplomatic relationship (sorry, great and eternal friendship), and all subsequent leaders in maintaining it, and all the ways China will help Sierra Leone until the end of time, annoy me, is because they’re empty platitudes. Besides being devoid of any criticism whatsoever, they obscure the complicated reality of what’s actually happening, which I find interesting. It’s interesting to me what ordinary Sierra Leoneans actually think about their country’s relationship with China. I know a few people on the Awoko staff feel strongly about China. Some of them went to China for higher education, at least one for a master’s degree, and most have also gone to seminars and trainings there. One staff member is there right now, writing stories and dispatches about his experiences for Awoko. One of these was about his visit to Lhasa in Tibet, and it was devoid of historical context and any mention of the Tibetan people. This isn’t exactly surprising, as of course the Chinese government wouldn’t allow anything else — but still. Some of the staff are passionate about China, and won’t hear a word against it. (One of my colleagues was getting tired of that, and wanted me to write something critical about China, which I was happy to). Of course I might feel the same as they do if I was Sierra Leonean. China has invested a lot in Sierra Leone — and nott just token gestures. It’s built roads, bridges, a dam and stadium and more. Earlier this week I was walking with a colleague outside a hospital and he pointed out that the road we were walking on was built by China — before, the area was impossible to navigate. China has provided medical aid and scholarships for Sierra Leoneans. And there’s no doubt a lot more I’m missing. So what exactly is my problem? I have one minor one, which is that I think this should be viewed as what it is: a business relationship. I don’t think it helps to have this attitude of unconditional gratitude. True, most diplomatic relationships are full of rhetoric like this, but this one takes it to a extreme. According to 2013 policy briefing I cite in the article (from the South African Institute of International Affairs by Simone Datzberger), China is very interested in exploiting Sierra Leone’s mineral resources. Frankly, why would it be investing so much in Sierra Leone if it wasn’t? China wants to build good will, and clearly has. Again, I don’t think China is evil or even necessarily a lot worse in this than other powerful countries. There are certainly questionable motives behind what the US, Russia, the UK, France and so many others are doing around the world. But that doesn’t make China’s presence in Sierra Leone any less worthy of scrutiny and skepticism. This is what I focused on in the column. I mainly wanted to just say people should treat China’s motives with a tiny bit of skepticism, even if they continue to welcome investments from them. But I think there’s another important criticism, echoed in another opinion column I cited. Unlike some other countries and international organizations, China doesn’t particularly care about fighting corruption and strengthening democracy in Sierra Leone. I think this is very important, but one of my colleagues not only doesn’t agree, he said he likes China’s hands-off approach. I didn’t even have to bring up this point — he came right out and said he appreciates that China doesn’t try to interfere in Sierra Leone’s affairs, unlike, say the IMF, whose aid is conditional. For example, he said, China lets Sierra Leoneans follow their culture. Other international groups will try to forbid practices like female genital mutilation (that term is not a misrepresentation– he used the common acronym, FGM). Of course, my reaction was…that’s good! It’s a horrible practice, not matter how culturally important people believe it is. Which it turns out isn’t how a lot of people view the issue here. That and other cultural gulfs is the subject of a future blog post. The day after I wrote this column, my editor told me as a by-the-way, “The Chinese are not very happy with your article.” I was glad (as always) to hear that my column at least occasionally gets some readership. But I was a bit surprised. My column was just one mildly skeptical article out of dozens of full-page pieces praising China. And it was an opinion column in an independent newspaper. What does it say that they weren’t happy about it? It’s not easy being vegetarian in Sierra Leone, especially if you want to eat what local people eat, or get three quick and easy meals every day. People like their meat and fish here, and I’ve been told that basically all the traditional dishes are made with one or the other, even if they’re just called potato leaf or cassava leaf stew, no mention of meat in the name. Everyone seems to know the word “vegetarian” — but like most places in the world it’s not common here, and so people don’t necessarily know what it entails. From my experience people often don’t realize that just taking the meat out of a finished dish, or eating around it, isn’t going to work for strict vegetarians. I’m sorry to say I can’t offer too much advice for vegetarians on things to eat here, because frankly I haven’t been able to eat much of what local people eat. I’ve been to a Lebanese restaurant in the downtown area a few times — it’s called, straightforwardly enough, Downtown Restaurant and it has a bunch of vegetarian Middle Eastern options including falafel. There are more upscale restaurants on the western side of town, but I haven’t been to any because they’re no doubt expensive and pretty far from the downtown area. In the evenings I cook a lot of meals with basic ingredients from the supermarket and market stalls (lentils, couscous, onions, garlic, potatoes), and at lunchtime, one of my colleagues at the newspaper, who makes meals to sell to the other staffers everyday, has been bringing rice and vegetables for me to the office, which is awesome and so thoughtful. I’ve had a lot of good snacks here though, including fantastic banana bread, biscuits and muffins from a bakery downtown. There are people everywhere selling boiled or roasted peanuts (I’m not sure why they’re boiled, but they’re great that way), and all kinds of fruit, as well as plastic bags of plantain chips (which taste just like thick potato chips) and popcorn. There are also stalls with roasted corn. It’s purposely kind of dried out and chewy, but tastes a lot better than that might sound. Today I was given one wrapped in a page from an illustrated book on flowering plants. I wrote an inevitable column for Awoko about my experiences being vegetarian here. It was something my colleagues told me I should write pretty much since I got here. I’m a vegetarian. I eat dairy products, but I mostly don’t eat eggs, and never meat or seafood. Before I left for Sierra Leone, one of the questions I was asked the most from people in Seattle was, what would I eat there? Being vegetarian is not the norm in Sierra Leone. Though everyone seems to know the word, I often have to explain exactly what it means, and which foods I do and don’t eat (which also happens fairly often in the US). I’ve been told that practically all Sierra Leonean food is made with meat or fish. In the first few days after I arrived, before I’d yet been able to eat a full meal, multiple people said to me, “I don’t know how you will survive.” Not exactly comforting. The good news is, I’ve survived, and I still follow my vegetarian diet. An unavoidable reality of being a vegetarian is being asked why. Why follow this diet? This is especially true somewhere like Sierra Leone, where it’s highly unusual. I’ve been vegetarian all my life, and I continue to be mostly for ethical reasons. In my opinion, there’s no justification for taking animal lives which are a lot more similar to our own than most people appreciate — for food, when we really don’t need to. Plus, being vegetarian is less wasteful and has less of an impact on the environment. The idea for the column I’m linking to below, which was published in Awoko on July 19, partly came from reading a piece in the Humanosphere covering the controversy over a Scottish actress who wrote about her experiences in Zambia in a way many took issue with (because it was apparently inaccurate and full of stereotypes). You can follow the controversy under the hashtag #LintonLies. The Humanosphere piece also links to Kenyan author and journalist Binyavanga Wainaina’s brilliant and hilarious satire “How to write about Africa,” which should be a required how-to guide for everyone, and which I’ll definitely be coming back to many times. That piece gives me tips on what not to do. But my column also came from thinking about in the last two weeks, how I should write about what I see here in Sierra Leone, and still not being sure of the answer. I’ve been adjusting to being here so quickly, and as a result everything seems normal, even if by the standards of the US or the developed world, it’s not. Should I feel normal or even hopeful in Freetown — or depressed all the time? 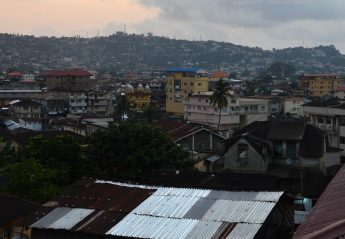 It seems there are two ways to look at, say, a street in Freetown. One is to be very aware of and point out all the problems — a broken down gutter system, starving stray dogs, pollution, dangerous and ugly traffic, dilapidated buildings, kids who are selling peanuts instead of being in school, and who may not know how to read…etc. ad nauseum. My instinct and preference is to not get lost in these problems, for a lot of reasons. Doing so puts a mental distance between the observer and the country and its people. I don’t think it’s exaggerating to say it can dehumanize the people who live there. This is what people who write off a whole country as hopelessly broken do. It’s also where the worst paranoid fears and stereotypes come from. It’s unfair to the people in the country who are well aware of the problems and working hard to fix them. For all these reasons, I feel like it misses the point — misses what’s fresh, nuanced and interesting. But at the same time…I’m torn. It’s obviously not good to be overly positive when the situation really doesn’t call for it. What messes with my head is that there just seems to be a conflict between, say going into a slum, interviewing people and painting a picture of everyday life that seems…just normal, and one slice of human existence — and pointing out what seems undeniably true on another level: that such a slum is a failure and a sign of a broken process. I recently read an article that made me think twice about how I should write about Sierra Leone while I’m here. In the article, published in the online publication the Humanosphere, which focuses on global development and poverty, reporter Tom Murphy outlines the controversy over a recent piece in the UK Telegraph by Scottish actress Louise Linton, in which she describes her gap year volunteering in Zambia at the age of 18. The piece, which was an excerpt from Linton’s memoir, was fiercely criticized on Twitter and in opinion columns all over the web for mixing outright inaccuracies and clichés into a patronizing and misleading stew. People also criticized how Linton presented herself as a “white savior” in the piece, swooping into Africa from Scotland to help fix the problems Africans can’t fix themselves. Linton’s own problem was being oblivious about how her writing and perspective came across. As writer Matt Hershberger noted on the travel website the Matador Network, Linton thought her writing was doing good in raising awareness of issues in Zambia. In an apology on Twitter, she said she was dismayed that it angered so many people. The Humanosphere piece I read also mentions a famous 2005 satirical essay by Kenyan writer and journalist Binyavanga Wainaina called “How to write about Africa.” The piece hilariously and mercilessly pounces on all the clichés, subtle and not so subtle, that Western writers use when they write about the continent. I went to the Freetown High Court for the first time last week with my Awoko newspaper colleague. We sat down on the bench for the press before anyone had arrived and got to see the courtroom fill up. I snapped this picture while it was still empty – photography and even audio recordings are normally strictly prohibited inside the courtroom. We were there to see the trial for a murder which had three suspects, among them Baimba Moi Foray, who for whatever reason goes by the moniker LA Chocolate. My colleague explained that he’s a famous “herbalist” in Freetown — someone who practices magic. Rumors say he drives an expensive car and rents an expensive house, and there’s no way he could be so rich without tapping into black magic — the money he makes from clients is just not enough for that kind of lifestyle. My colleague could attest to him being rich — she said she’d once seen him at a beach restaurant, throwing handfuls of money in the air from a bag. He and two others were standing trial for the murder of Sydney Buckle, aka DJ Cleff, a popular DJ, in May 2015. Buckle had last been seen at the birthday party of one of the suspects, Avril Oreh Renner. When his body was found, people assumed he’d died of Ebola. But the body was mutilated. Now it’s thought that Renner, Foray and his bodyguard Foday Kamara murdered Buckle in some kind of ritual to gain black magic power. This was all pretty shocking to to me, but I was even more disturbed to learn that although ritual murders like this aren’t common, most Sierra Leoneans are rock solid in their belief in magic, both dark and light. When I asked my colleague about this before the trial, I was thinking, “People don’t actually believe this is real here, right?” and my questions to her got at this in a more subtle way. But she said everyone believes black magic here including her, and it is absolutely real and works. But she also said “it works if you believe in it.” This is an important distinction. I think that last statement makes sense, and explains why these beliefs might persist, but there’s clearly a contradiction there. I wonder if my colleague was ambivalent about whether she really believed — I didn’t press the point further. Yesterday I was talking about this with another journalist from a different newspaper at a World Bank press conference (I’ll have another post on said conference), and he said he also believed in it. “I’ve seen it,” he said. He explained that dark herbalists have “witch guns” which they psychically shoot people with, which will supposedly kill them. Premature deaths are often blamed on this. Here’s an article I found that explains more about this. Apparently, people would use these witch guns during the civil war. He was a bit skeptical because he remembered having an argument with someone about who would be the first to die in a one on one battle in a locked room — someone with a witch gun, or someone with an AK-47. He thought the AK would win out. I asked him if both Muslims and Christians believed in and used magic, and he said only the Muslims mix it up like that. “Christians believe in Jesus Christ,” he said. I doubt this, especially because it’s just the thing a Christian would say that. The trial was interesting to watch. It was delayed 20 minutes because a member of the jury was stuck in traffic. When he arrived and explained to the judge, he was laughing a bit, which the judge sternly admonished him for. There were several members of the public present in the back, who Maryam said may have been family members of the accused or the victim, or just people interested. The three suspects had three defense attorneys to defend them — as my colleague explained, people can hire as many as they want. Earlier, we had met with one of them. He was dressed in a perfectly crisped tuxedo-style suit, and had a smooth, businesslike and slightly cold manner. The trial wasn’t incredibly eventful — the suspects decided they were not going to testify after all, and instead rely on statements they originally made to police. After these three suspects said this and were led out, a few other murder suspects were processed, some very young. It was hard to follow what legal proceedings were going on, and I don’t have a good understanding of legal proceedings anywhere, let along Sierra Leone. These other accused looked scared. I helped write a short write up of the trial and what happened here. I also devoted one of the daily columns for Awoko to the case and my thoughts about it. The column ran in Awoko newspaper on Monday, July 18 (I’ve linked to near the bottom of this post), and in it I describe more of the scene in the courtroom. I felt compelled to write about this case in my column because I found it very disturbing. The column goes a bit into what I’ve been thinking about since I saw this trial (it was hard to get out of my mind, and still is). But my exposure to this ugly case was nothing compared to my colleague. The reporter covering the courts beat has reported on this case ever since it started. And I can’t imagine what it was like for my other colleague, who said she had to take pictures of the corpse. These journalists are tougher than me when it comes to things like this. I wanted to get at why I found this so disturbing in the column. Mainly I think it’s the pointlessness of it. I mean, all murder is, but somehow murders like the mass coerced suicide in Jonestown, or other weird cult murders, are especially disturbing to me, and I think the reason is they’re based on fantasy and delusion, and no one had to die. It’s just utterly senseless. Black magic has a real power — but only because people who believe in it sometimes do terrible things based on their beliefs, and because people attribute bad events to black magic, and the placebo effect. I don’t expect the column I wrote to persuade anyone who really believes in black magic, but since the audience is Sierra Leoneans, most of whom believe, I thought I’d give it a try. For my argument to make sense, I explained why I think black magic isn’t real, and then went into how it can be defeated if everyone stops believing in it. Only then would it lose its power. I know this is kind of naive — these beliefs exist and persist for many reasons. Belief in black magic isn’t going to go away overnight, if ever. And as I acknowledge in the column, I’m no anthropologist, let alone one who studies Sierra Leone, so I really have no authority to draw on when it comes to this subject. I just can’t see how it would do anything but good for Sierra Leone to move past these beliefs. On Tuesday, I sat in the Freetown High Court for less than an hour, then helped write a few paragraphs for the newspaper on what has to be the strangest and most disturbing story I’ve reported on so far in my still very short journalism career. I was on a bench for the press at ground level, squeezed together with a few too many local journalists. The two men and one woman sitting high above me in the huge court room were accused of murdering a popular DJ at the woman’s birthday party in May 2015. When it was found, the corpse was assumed to belong to a victim of ebola. But it was mutilated, with toes, fingers and nose cut off. It’s now believed that Sydney Buckle, aka DJ Cleff, was killed in a ritual murder. As my Awoko newspaper colleague explained, one of the alleged murderers is Baimba Moi Foray, aka LA Chocolate, a famous “herbalist” or “juju man” in Freetown said to have acquired his wealth through black magic. Rumors are that he rents an expensive house, drives an expensive car, and once threw out handfuls of money at a beach restaurant. He makes money from clients who want his magical expertise but people say there’s no way he could make as much as he does doing just this. The implication is that the money is somehow coming from the black magic he supposedly practices. I knew I was going along with my colleague to report on a murder trial that day. But when we first sat down in the then-empty courtroom, and she filled me in on these details, I couldn’t believe what I was hearing. We’re seven months into 2016, and the United States and the world have already been traumatized by a succession bloody, senseless acts of violence. Last week I was just getting settled into Freetown when the headlines greeted me with news of death: two African American men in separate cities killed unnecessarily by the police, one after the other, and just a few hours later, five police officers gunned down in revenge by a sniper in Dallas, Texas. It’s been interesting being in West Africa while these events unfolded, and hearing reactions from people here. On more than one occasion I’ve been asked for an explanation for why this happens. Why do police in the United States seem to kill black people so often? The issue has sadly become such a common subject of conversation in the United States, in the headlines and on social media. I hadn’t thought about how inexplicable this phenomenon might seem to people in the rest of the world, and how many questions are raised by its constant recurrence. The subject came up this past Saturday while I was walking toward a polling station with several Sierra Leone journalists in Lunsar, north of Freetown. It was a clear, sunny day and we were walking between the highway and a ditch on the other side. One man was curious if this narrative of black people being killed by police was more the result of media bias than anything else. Didn’t police kill white people as well? As far as I understood, I offered, the proportion of black people killed is much higher. One man said he was under the impression that this happens because police fear black people and see them as dangerous. He noted pessimistically that if it’s an instinctive, unconscious fear, it might be hard to do anything about the problem. He worried that these police killings could lead to race war and ethnic fighting in the US.